Last week, Meghan tagged me in this little trend that's circling the blogosphere, five things. Each tagged person must share five things that their readers might not know about them, and then pass the baton to another five bloggers. Initially I felt as if I had been looped in on one of those chain mail things we all used to do as kids, or those emails that would tell your fortune as you scrolled, but then threaten the life of your first born if you didn't forward it to 50 people. I have never been on a roller coaster. This is because I absolutely hate the feeling of falling from high heights. I have jumped off a high dive or cliff into water a time or two in my life, but it was always motivated purely by peer pressure. I'm just one of those people who doesn't enjoy that stomach drop when you're whooshing downwards at high speeds. I was in a sorority in college. Oh yes, I was one of them. I went to a huge state school (University of Arizona) and at the urging of my mom, I rushed as a freshman, before classes even started. My sorority made my college experience, and I'm grateful for every minute of it - the good and the bad. The Greek system catches a lot of flack, and some of it is deserved, but it made me feel like I had a place in a sea of 35,000 undergrads, and gave me the best four years I could have asked for - and more than a few best friends, too. I'm related to a president. Zachary Taylor was the 12th president of the United States, elected in 1849, and died in office just 16 months later. It was the third-shortest term in history. He was a member of the Whig party, the only president elected from Louisiana, and his moderate stance on slavery paved the way for The Compromise of 1850. Quite the legacy, amiright? And yes, if I had been a boy, my parents thought of naming me Zachary. My dad was the one who urged me to start a blog. Way back in 2009, when fashion blogging was relatively new and I was still living in Seattle and looking for an outlet for my creativity -- my dad knew what was up. And you know what I said to him? "Blogging is for dorks, Dad." Suffice it to say, I've been eating my words ever since. I loved learning more about you! So cool that your dad was a major reason for starting your blog & that you are related to a president! Also, The Heathers was the first movie I watched with my now fiancé, needless to say it has a special place in my heart! 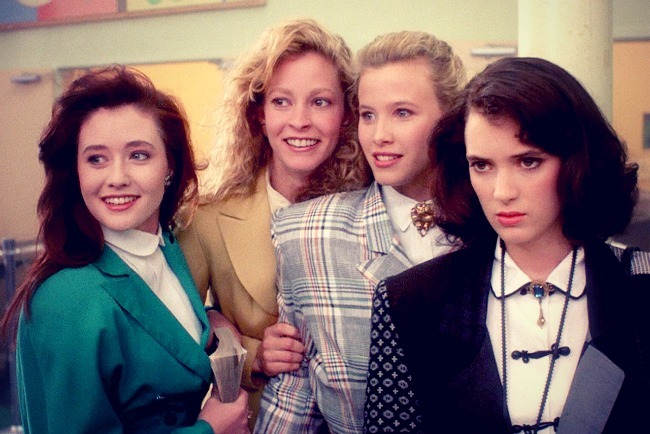 I lOOOVE Heathers.... I had forgotten about it, but now am inspired to read it again! Adorable that your dad urged you into blogging. So glad he did! Aww your dad sounds like the sweetest. So glad you took his advice.